European countries have vowed to maintain “effective financial channels” and to keep trading with Tehran after the US announced that the EU is not among those spared from its sweeping sanctions against Iran. European countries suddenly discovered that they were not on the list of the ‘lucky ones’ that their ally, the US, decided to exempt from the new wave of all-encompassing sanctions it plans to unleash on Iran. The sanctions, targeting Iran’s shipping, finance and energy sectors, which come into force on November 5, are also designed to punish those countries that dared to do business with the Islamic Republic in defiance of the US pressure. Only eight nations were graciously granted exemptions by the US, according to Secretary of State Mike Pompeo. However, Pompeo made it clear that the EU as a single entity is not on the list, sparking an angry reaction from the US’ western allies. Washington also specifically mentioned that it plans to target the special mechanism the EU has been creating to circumvent the restrictions, prompting its allies to fight back. In response, the EU foreign policy chief Federica Mogherini, together with the foreign and finance ministers of Germany, France and the UK, vowed to maintain “effective financial channels with Iran” and in particular to continue buying the Islamic Republic’s oil and gas. They also said that despite Washington’s pressure the EU is still committed to establishing a “Special Purpose Vehicle” for Iran-EU trade. The European nations will seek to protect its companies engaged in “legitimate business with Iran,” the statement said, adding that the EU will cooperate with Russia and China in particular to achieve these goals. 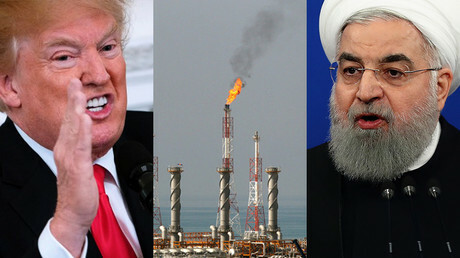 Since its withdrawal from the 2015 nuclear deal with Iran, the US has been pursuing a policy of “maximum pressure” on Tehran, vowing to bring its oil exports to ‘zero’, much to the dismay of the European countries, which praise the agreement as “a key element of the global nuclear non-proliferation architecture” and have re-affirmed their commitment to the deal. Washington, meanwhile, seems to be ready to stop at nothing to force Tehran to bow to its wishes, with Treasury Secretary Steven Mnuchin even threatening sanctions against the international service SWIFT, if it refuses to block Iran’s transactions.